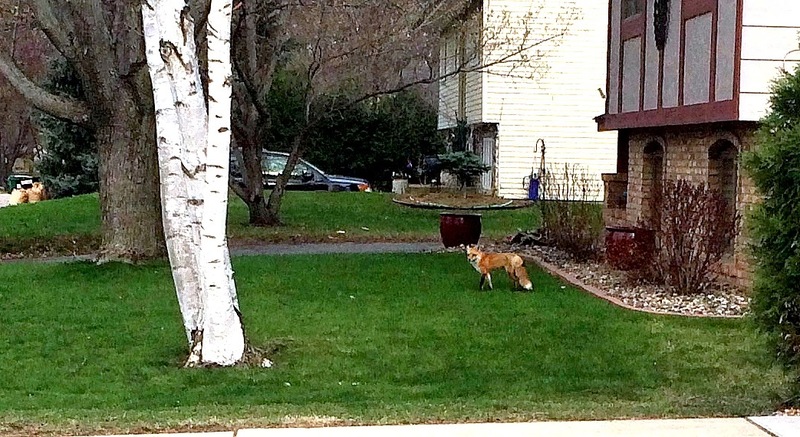 I was driving to work early this week and I nearly ran into this fox walking across the street. Naturally I had to get out of the car to see what he would say. But he just looked at me while I snapped this picture and then walked away. I must not have been doing something right. On Wednesday night, we went to watch a concert put on by the Prior Lake High School Freshman Band. Luke takes his percussion responsibilities very seriously. No matter how hard I try to heckle him from the crowd, he won't give me any reactions. Avery on the other hand is quitting band after this year, so he was more than willing to participate in my shenanigans. It wasn't until after the concert that we noticed we were all wearing dark shirts with stripes. And that we looked good. Grandma Linda and Miss Sheri were quite proud of the boys performance in the band. They did a really nice job. On Friday night, we were treated to a visit from the Zitzewitz and Brown Families. Troy Brown has been our scout master since the boys were in first grade, but I've also learned that he likes to travel with really good food. He's an engineer by trade, but literally could be a gourmet chef at many of the 5 star restaurants I've enjoyed over the years. On this particular night, when he said he was bringing fixings to make nachos I didn't really think much of it. Then I saw him start to go to work. His artistry nearly brought tears to my eyes. He started off with some delicious chips and then added a combination of pulled pork and pulled beef. He had three different kinds of cheese and I told him to be generous with the spicy version. He topped it off with a multitude of veggies, three different kinds of salsa, spicy sour cream, and some other sauces I didn't recognize. When he was done I wasn't sure if I was supposed to eat them or mount the plate over our mantle and use it as a new decoration for the house. Lucky for me, I chose to eat them. It felt like God dropped a little piece of heaven in my mouth. While the adults were in fawning over Troy's cooking, the boys avoided us by hanging out in the hot tub. For some reason, they don't seem to like to spend a lot of time with their parents. After the sun went down, it was time for the kids to go inside and the adults to come out and play. I'm not sure if the Browns were prepared for all the 80's music karaoke that happened, but I think they had fun all the same. Every time I catch Karl peeing in the hot tub, he tries to tell me he's not doing anything. But you can totally read it in his face. On Mother's Day, we took our moms out for Sunday brunch at the Roasted Pear in Burnsville. The food was good, but I didn't see any trace of pears anywhere. I kind of felt ripped off a bit. I give my mama a hard time a lot, but I sure do love the little lady. She's always been there for me no matter what. I'm blessed to have her in my life and to be her son. On the way home from breakfast, we stopped by the local Buddhist Monastery to see the Jade Buddha for Universal Peace. You can read about it here. The people there were so nice and welcoming. I was glad we stopped by to see this impressive display. When we were walking into the monastery, we saw a baby turtle. These young girls came up and explained to us how to see the Jade Buddha and then took the turtle to a safer place than he was and set him free. They said they named the turtle Alex which I thought was kind of a strange name for a turtle, but who am I to judge?